Photograph This! : Flowers. Add water. to camera left, behind and below the flowers. A foam core board provides fill and the black background cover some of the light from the Sunpack. The Alien Bee gives the texture in the red flower and lights the drops at camera right. The Sunpak lights the yellow flower from behind. There is also a little gobo just below the flowers at camera left. The water was just a simple plant sprayer that I was rather furiously pumping while taking shots. Getting the time right was the difficult bit. 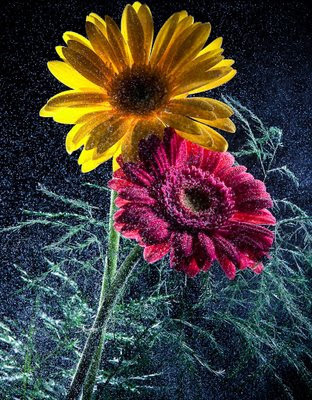 I am quite ahppy with the result; the cross lighting sculpts the stems and the general backlighting lights up the water drops against the dark background. Optional: I added a small negative temperature shift in Lightroom to make the water look bluer. Now the important bit: How do I get the water drops sharp? Shutter speed is largely irrelevant as the max sync speed is 1/160th and the flash duration is shorter anyway..but how much shorter? I needed the flash "pulse" to be as short as possible. As a first attempt using the strobes at ~ 1/2 power and setting the camera at iso 100 and f16 produced streaks with each water drop. Not good. The solution is to lower the power of each strobe, as that makes the light pulse shorter in duration. Less light = larger aperture...however, I wanted the depth of field to stay decent as we want the drops to appear sharp. A good compromise was to shoot at ISO400 and f11, lowering the AB power to 1/16th- and the Sunpak at 1/8th. The final camera settings: ISO400, shutter speed 1/160th, f11, 52mm. Overall shooting time: 45 mins. I like flowers.